The brand new lifestyle hotel NYX Prague welcomes you to the hottest location right in the urban center of Prague! Let us take your vacation to the next level! 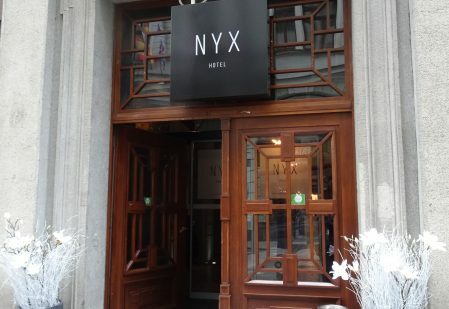 The NYX Prague hotel is a historical building built by one of the most famous Czech architects Josef Gočár. You’re new to the city and want to explore the best locations? Meet your personal tour guides – the City Lovers – to get to know all of Prague’s hip places and secret spots. Local artists are giving the hotel a special touch with smashing street art, installations and handmade sculptures. The hotel is located right in the dynamic city center surrounded by plenty of cool shops, restaurants, and bars! Visit some of the most famous attractions like the Mucha Museum, the world heritage site “Wenceslas Square”, the historic Old Town Square or, for our lovebirds, the romantic Charles Bridge. You feel like having a yummy snack or a delicious cocktail? We’ve got you covered! Locals and tourists come together at “Clash” to spend a fun evening… or night! Got curious now? Stay with us at NYX Prague and discover the city from a whole different level!